In 1992 Ekaterina Gordeeva and Sergei Grinkov skated to the Nutcracker Suite for Disney Christmas on Ice. The backdrop for this number was the Lodge at Sun Valley. Sergei and Ekaterina skated while snow was falling on the ice against colored lights and snow drifts. Even though I wasn’t skating seriously at that time as I was busy raising a family, I knew someday I would have to visit Sun Valley’s rink. Fifteen Years Later in August of 2007, I signed up to take part in an ice dancing seminar at the Sun Valley Skating Center. Sun Valley is a huge resort. The Lodge, which is the most expensive place to stay, is the centerpiece. Beyond the Lodge is the Inn and then three of four condominium complexes scattered through the area. We stayed in the condo for two nights and could easily find our way around walking to restaurants, bike rentals, market and shops. The facades of the buildings had a German flair. Flower baskets, grassy areas, tables and umbrellas, ponds with ducks, waterfalls and streams decorated the landscape. Chimes played Moonlight Sonata to mark the hour while swans glided on the pond. I wondered why our cities couldn’t be like this, why our taxes couldn’t support this kind of infrastructure. Instead money is going to that horrible Iraq War, when we should be building beautiful cities–in both countries. The entrance to the Lodge was magnificent. Swans slid across the surface of the pond that graced the entrance, and uniformed and friendly doormen greeted us at the massive wooden front doors. The lobby, furnished with elegant sofas and chairs and brass chandeliers hanging from the paneled ceiling, was out of a Forties movie. Doors on the other side of the lobby led to terraced verandas where flowers cascaded out of window boxes. The skating rink was center stage. Skaters floated across the ice on this warm summer’s day. The dream became reality of actually being at Sun Valley. Our instructors for our first skating clinic were the famous Lithuanian dance team of Margarita Drobiasko and Povilas Vanagas, whose interpretation of a Pirates of the Caribbean is one of my favorite ice routines of all time! They took artistic fencing lessons as part of their preparation for this routine. Filmed in Moscow with St. Basil’s beautifully lit in the background, this act was like Ekaterina and Sergei’s performance as snow was gently falling as they were skating. 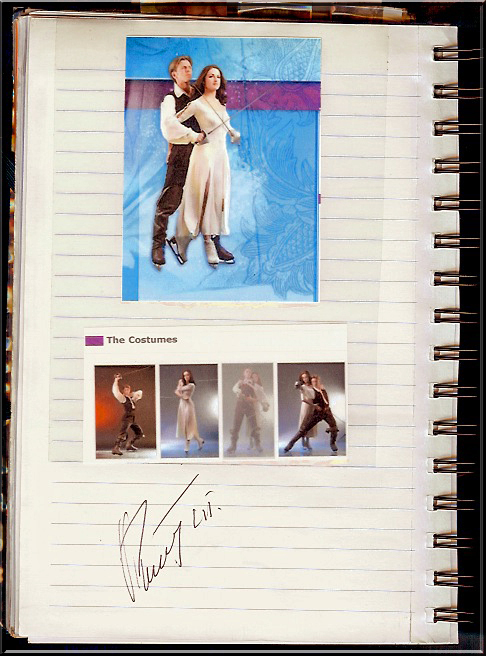 I have Povilas’s signature in my travel journal. The twilight program dance was my first opportunity skate on the outside rink. Skating while wearing light clothing and providing “entertainment” for all the spectators watching from the verandas, walkways and bleachers was fun. The ice was a different quality from my home rink and required getting used to it’s slightly irregular surface. When the program dance began, the skaters began to follow the required patterns of each dance, quite beautiful to see couples skating as pairs in a formation. Unfortunately, I only knew three dances and barely those as most of the dances involved complex steps. My big challenge is to learn to switch directions with a mohawk or three turn. Knowing these steps is not enough as speed and grace is essential. One of the leaders of the skating seminars was kind enough to show me some of the steps, but I was very much afraid of falling and taking her with me. With Oleg I know he will “catch” me and prevent any mishaps. I managed to put in an appearance at the reception, had some interesting conversations, learned some of gossip in the adult ice dance scene–mostly about judging, testing, dance levels and coaches. Several skaters from the Ardmore Rink tried to talk me into joining their synchronized skating team. By the time I returned to the motel room, I was exhausted. The next day our sessions began before nine. The exercises were fun, and I could adapt them to my level. I was, however, somewhat intimidated by the expert level of most of the skaters who have devoted decades to skating. I wondered whether I was a good fit for this seminar. I resolved to put that out of my mind and not entangle my pride with performance. I was there to learn. I skated as many sessions and seminars as I could. However, the pain from my hip spurs eventually lock my leg. I even tried skating mostly on the left leg, practicing three turns and good position. The instructors added an extra clinic, theater on ice. The coach played different musical selections and distributed props such as scarves, balls, pompoms, swords, hoops and fans. We were then encourages to compose our own steps and moves to the various musical selections: hip-hop, Hawaiian, twist, rap, disco and so on. On the last night, we had dinner at the Lodge. Food, elegantly served from central stations, offered great variety. After dinner, we watched the weekly ice show. At the end of the performance, we collected autographs and took photographs, one here of John Zimmerman, 2002 Olympian. 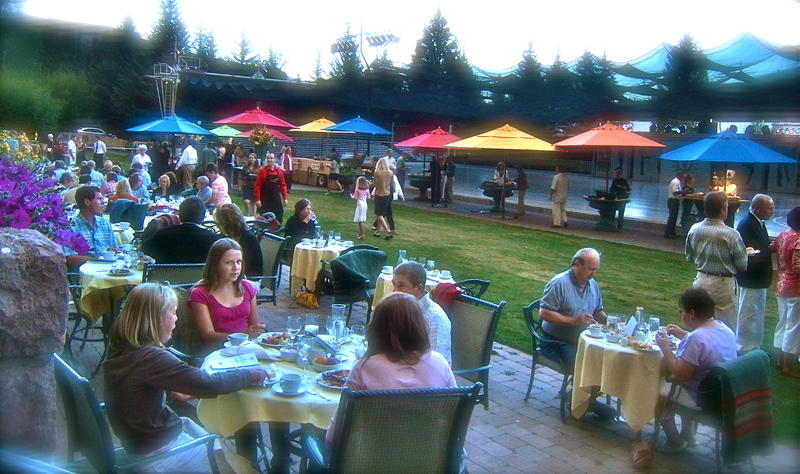 Sun Valley Lodge is just outside Ketchum, a quiet town with upscale shopping districts. Obviously, the town planners devoted much effort to create a lovely street scene. Paving bricks lined the sidewalks and colorful flowers filled the planters. Sculptures and fountains anchored the plazas. 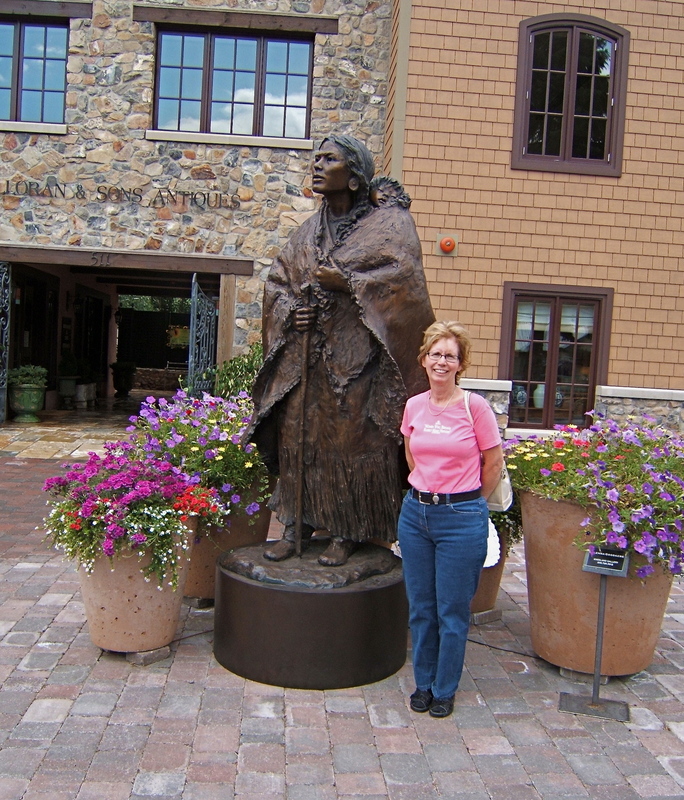 One particular statue was of one of my heroines: Sacagawea. Tables from the restaurants and cafes spilled out onto the sidewalks, making it very convenient for those walking dogs, of which there were many, to stop in for coffee. Bike paths branch from the town center into the side streets and along Route 75. I took an afternoon off from skating to go with Jean on a chair lift ride up to the top of Bald Mountain. Riding the chair was thrilling as the chair lifted us into the mountain as the village below grew smaller. The wind whipped around us; we could only imagine how cold the ride would be in the winter. Two chair lifts took us near the summit, and we walked the rest of the way. 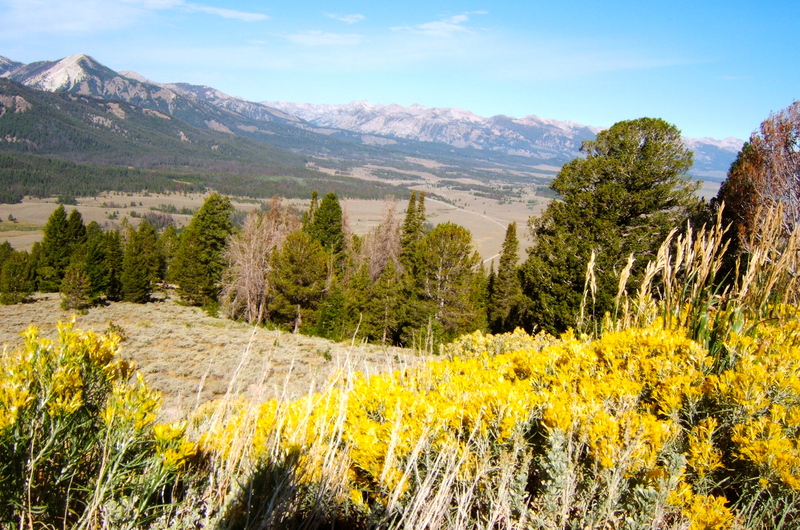 Since the path had few trees, we had panoramic views of the rugged beauty of the wilderness on every side, and we could see as far as Nevada. On our way down from the summit, we saw white puffy smoke drifting up from the valley below (photo above). Drought conditions have persisted all through the area, and we wondered whether this fire was the beginning of a disaster to come. The next day a plume of smoke darkened almost a third of the sky making the sun an eerie red color. 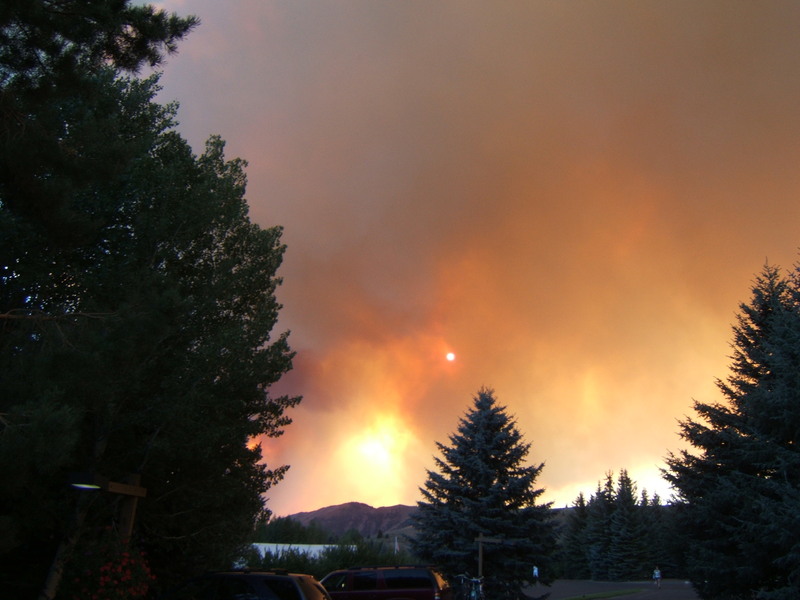 As the sky lightened from the sun and smoke clouds, Jean and I thought we may be forced to evacuate, and we considered whether we should leave early as we had to catch a plane on Sunday. Turns out the fire was ten miles away. Fire fighters used water and retardant to put it out. The next morning smoke hovered over the valley as we drove along Route 75. We integrated a road trip from Utah to Idaho into our visit to Sun Valley. We started from the airport at Salt Lake City, stopped at Twin Falls, Idaho and stayed two days at a ranch in Stanley. 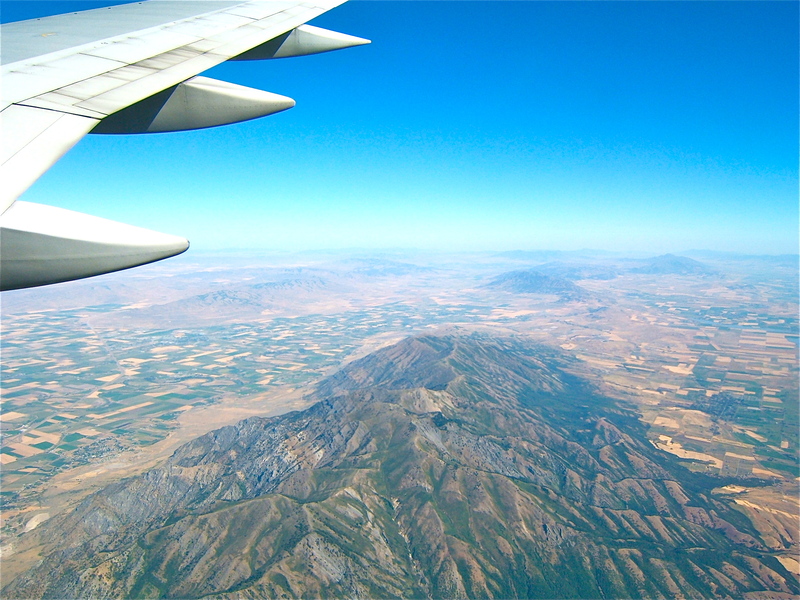 The day was clear for flying so I decided to take notes and photographs as we flew across the American landscape. Using a map, I identified various geographical features such as the Mississippi and Missouri Rivers. The photograph at the right shows the beginnings of the Rocky Mountains surrounded by the patchwork land divisions. After landing, we picked up our rental car and started our journey on Route 84, and then forking at Route 15. The road was excellent with mountain views but only few towns were available along the way for stopping for a meal. In Idaho we made a sharp left on Route 86 at Pocatello. The intense afternoon sun glared through the windows, and we were beginning to feel the effects of the morning wake up call at 4AM! Driving into Twin Falls, we were very relieved to find our motel quickly; exhausted, we fell into bed. 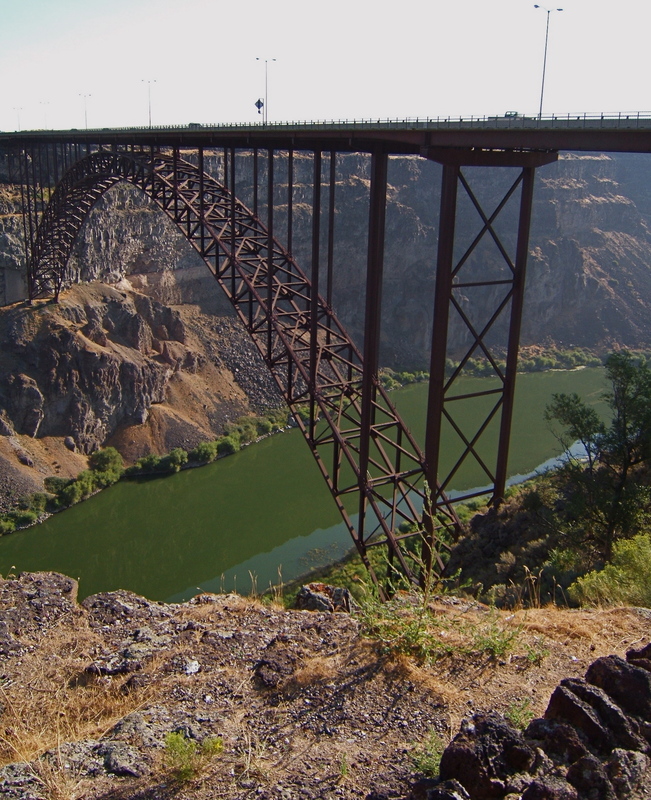 Driving into Twin Falls, we crossed an iron bridge which spanned a gorge of the Snake River. Parks at the bridge provided vantage points for viewing the canyon for miles. The city of Twin Falls was a typical tourist town with restaurants and motels seemingly endlessly lining either side of the main highway. Later in the evening we drove out to Shoshone Falls, a drive of about six miles outside of town. A well-manacured park offered viewing of the falls, often called the “Niagara of the West.” We walked along the canyon and immediately noticed the temperature differences as we walked in and out of the shade. Scents of pines, sage and rose mingled in the mist of water dripping off the rocks or falling from streams. The sound of the falls followed us as we meandered along the path along the river. August 13: Malard Gorge State Park to Idaho City to Stanley. About an hour’s drive on Route 84, we stopped at Malard Gorge. A pamphlet guided us through the park, which covered six areas, each one beautiful and unique: gorge, falls, pond, valley, rock formations and vegetation. The park had few visitors, which was surprising given the beauty of the park. We continued on our drive and saw the effects of forest fires from 1989, which ignited hundred of fires in the mountains. Many trees survived, but their bark was blackened. We stopped at Idaho City, a small village attempting to set itself up as a replica of a western town drawing from its history of gold mining, which brought over 20,000 people to the area in the mid-1800s. This was a worthwhile stop that made us feel we were in the West–with an added bit of whimsy. About nine miles south of Stanley, we found our accommodations for the next two nights, Idaho Rocky Mountain Ranch. We checked in at 5 and didn’t have long to wait for a snack as appetizers were served at 5:30: cheese spread and pita bread and shrimp in a sauce. Beverages were always available including coffee and hot chocolate. The lodge, warm and inviting, featured large windows and comfortable chairs centered around a massive stone fire place. Monday was chuck wagon night and dinner was cooked in a dutch oven, one buckboard ride away from the ranch. Vegetable specialty dishes and apple cobbler were my favorites. A singer-guitarist played for us. A short video features the singer with pictures from the wagon ride. After dinner we hiked to Knob Hill where the views were panoramic and the breezes full. As the sun was setting, the craggy mountains stood against the sky, soft light resting on the nearby hills. Cattle grazed in the valley below. The ranch is open between June and September, closing during the other months because of the cold and snow. 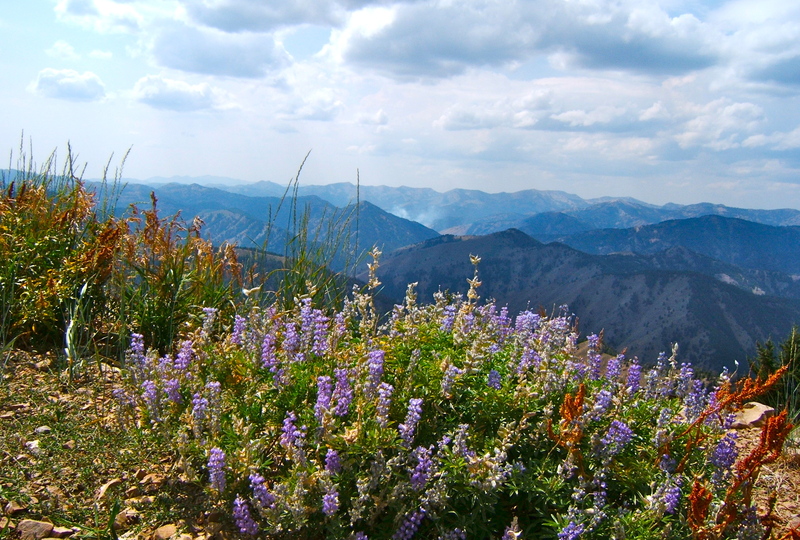 Stanley, Idaho is one of the coldest placed in the United States, sometimes reaching 60 degrees below zero. A small log cabin served as our resting place. A large stone fireplace flanked by two rocking chairs occupied most of the space on one wall. Iron hinges and latch were attached to the wooden door, decorated in a mosaic. Dressed with a red Indian blanket, the bed supported a down comforter. The night stand was a roughly honed log in the shape of a square. When no light remained, we left the cabin to explore the meadow. The stars sparkled like diamonds on black velvet. We opened a window before going to bed, the cool mountain air washed over our faces during the night. Let me start out by saying the kayaking on the Salmon River, the only free-flowing river not controlled by dam water, was an incredible experience and not for the faint of heart. Preparations for the trip took some time as we had to decide whether to paddle in the rafts with a guide or take a kayak. A woman our age opted for the raft. According to the website, “no experience necessary” was required for this trip despite the promise of 3-4 class rapids. Jean and I are experienced kayakers but not on class 3 rapids! It crossed by mind that perhaps we might be “over our heads” or the water might be over our heads! During the brief instruction, the guide pointed out the dangers, especially “foot catches,” the possibility of a foot becoming lodged between rocks and the potential for drowning. The guide told us that an experienced guide recently died in such a way. He warned us not to put our feet down into the water under any circumstances. Most importantly, no matter what, we were told to “keep paddling,” which was the best strategy in dealing with the rapids; and we should follow the exact route of the guide kayak. Unfortunately, both these instructions proved to be problematic. We launched our crafts and meandered down the Salmon encountering class 1 rapids without difficulty. However, we soon arrived at the class 2-3. I began paddling like crazy to negotiate the rocks, trying to remember the instructions about leaning into the rocks. The currents pulled in different directions, none of which I wanted to go. That’s where the rapid paddling came in. Because of the fast current the rocks came quickly upon the kayak with little time for decision-making on which direction to go. The water drove the kayaks over “waterfall rocks” or rocks that rise up from the river where the water flows smoothly over the top. Unfortunately, that was a great place to get stuck. Before proceeding to the next set of rapids, appropriately named, “devil’s wash bowl,” the instructor called us over for advice. Warned that kayakers often found themselves on the rocks or overturned on this stretch, the guide reinforced the previous directions to follow the path of the guide raft. I had already learned that I had nothing to fear from the rapids, it was the rocks that provided the challenge. I aggressively met the test padding from side to side keeping my eye on the kayakers in front of me. However, the guide raft soon disappeared out of sight so the path was non-existent. One large raft became lodged in the middle of the river so to avoid hitting it, I veered to the left, my kayak hitting a huge rock and angling up on the left side while wedging on a rock on the right. Oh, no, stuck! I used my paddle trying to wedge myself out of my predicament and then began rocking back and forth. Meanwhile, Jean’s kayak had landed between rocks on the other side, and she was unable to move. The guide made his way over to Jean, and she got moving again. Just then I rocked myself out, my kayak spinning around only to become lodged between rocks, only backwards. My situation looked impossible again, and the thought occurred to me that I might wind up in the turbulent water. Time seemed to pass slowly as I continued to rock the kayak, finally freeing myself–the folks below cheering at my release. After a delicious breakfast at the ranch, we were on the road by 9AM. We often stopped along the way for pictures of the scenery. The Sawtooth Mountains and Salmon River followed us on the right side of Route 75. From the base of the mountains, broad meadows extended toward the road; cattle and horses grazed in the fields. 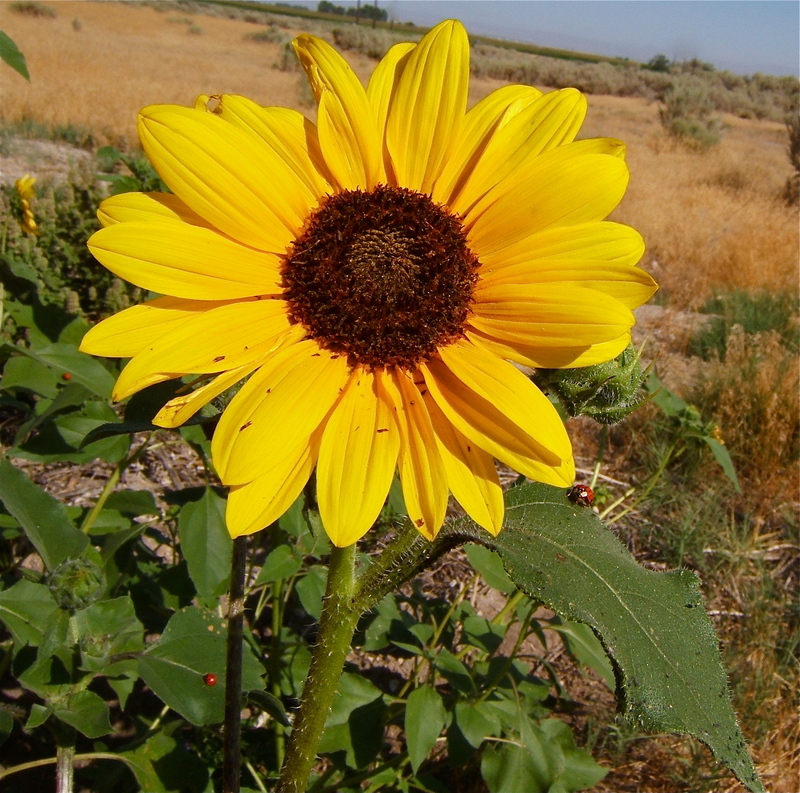 Wild flowers, especially the fragrant yellow sage, lined the road. We spotted blue birds and hawks.